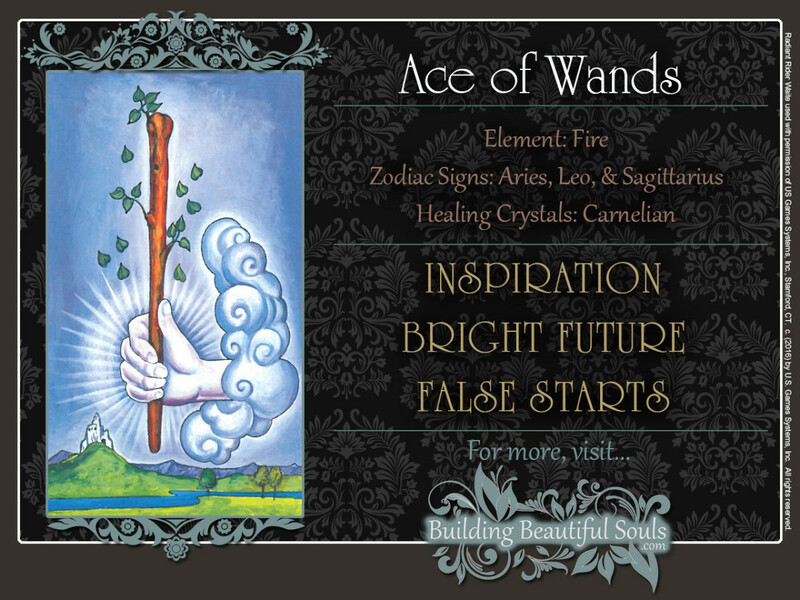 The Ace of Wands tarot card is excellent news for beginnings of any kind! Everything is in the right place. To boot, the universe blesses you with inspiration and creative energy. Look at the glittering silver sky and the green landscape on the Ace of Wands tarot card. Silver symbolizes inspiration and intuition. The fertile lands irrigated by the clear, blue river are the perfect soil for new endeavors. Farther ahead on the Ace of Wands card, the tall castle on the hill promise success and great accomplishments. The mountain range in the distance symbolizes intellectual and spiritual understanding. In short, the future looks bright. While everything is perfectly aligned, the white, radiant hand reaching out of the cloud in the Ace of Wands shows that a divine blessing is here at work, too: the wand. No worries, it’s not a “therapeutic” whack on the head! Wands are associated with the element of fire, the energy that keeps the universe in motion. In this sense, fire is a life giving force. That’s why leaves are growing on the wands in the tarot. While it can be destructive, fire actually helps to preserve and improve life, when used wisely. Our ability to use fire for cooking and powering engines, for example, is one of the things that sets us apart from other animals. Wands are also associated with fire because Prometheus, a titan in Greek mythology, touched a stick to the sun when he stole it from the gods as a gift to humanity. In the Ace of Wands tarot card, the 10 leaves growing from the wand express its live giving power. They’re a reference to the Kabbalistic Tree of Life, a symbol of the universe. 8 leaves are falling to the ground, changing into the Hebrew letter Yud as they descend. Kabbalistically, this number refers to Mercury, the god of magic. The letter Yud shows that this is a divine blessing. The power of fire is indeed magical. Start revving your engine! The Ace of Wands tarot card is like a cosmic checkered flag, and it’s about to drop. If you stay focused on your goal, there’s no way you will lose this race. Whatever you’re about to begin, you couldn’t have hoped for better starting conditions. As an unexpected bonus, the universe has added extra octane to your tank. The Suit of Wands is all about creative energy. The Ace of Wands is especially powerful for anyone working in a creative field. If you’ve been suffering from writer’s block, you had better spent that time constructively – such as stocking up on pens and paper at the local stationery store. That epic novel or cycle of romantic poems has already been telling you to get busy. So roll up your sleeves, have a good stretch, and start writing! Say goodbye to nagging doubts and old hangups! The Ace of Wands tarot card brings a message of courage and vitality. Your attitude is improving by leaps and bounds, and true to the law of attraction, the cosmos is responding in kind. You know that your moment in the sun has arrived. In this spirit, you can achieve anything your will desires! If you’ve been struggling with a situation you believed to be hopeless, you are suddenly discovering untapped reservoirs of optimism and resolve. Filled with new energy, you know that you can go the distance. If you’re a man, and your partner and you have been trying for a baby, good news may be on the way soon. Perhaps you can find a healthier way of celebrating the new arrival than handing out cigars at the office. When reversed, the Ace of Wands tarot card points to a moment of confusion. Here, it’s important to keep your head on your shoulders. You don’t want your current disorientation to escalate into full-blown chaos. That could spell an inglorious, early end to something that had a very promising start. The energy of the Ace of Wands shines dazzlingly bright, but burns off quickly. It’s meant to give you the necessary pickup to get you going. In a sense, it’s just like your morning coffee. Yes, it’ll give you the energy and motivation to leave your house and get to work. However, if you want to make it through the rest of the day, you will need to eat food, too. A coffee-only diet will only end in disaster. Your confusion could arise from having too many choices at once. For example, if you’ve been flirting with several people at the same time, don’t be surprised when several prospects show an interest in you. That’s only a fun dilemma when you’re looking at it from the outside. The reality often ends in awkward and embarrassing scenarios. There is only one way out: grow up, fess up, and hope for the best. Another type of confusion shown in the Ace of Wands tarot card is what Arthur E. Waite calls “clouded joy.” That’s the kind of joy you can’t see because you’re too busy worrying about something else. No matter how busy your life may be at the moment, you can always take five minutes out of your schedule to reflect on the many things you can be grateful for. The reversed Ace of Wands also suggests that something is about to come to an end. But that’s not always a bad thing. In fact, there are plenty of times when the end of something spells very good news: such as a job search, a garnishment, or a hospital stay. The Ace of Wands tarot card correlates to the meanings and symbolism of the Number 1. Kabbalistically, it corresponds to the divine spark. In traditional numerology, ones are associated with the generative powers of the sun. When these energies combine in the element of fire, they give you the extra oomph you need to set great things in motion.